Logistics halls essentially function in the same way as big cities: When space is at a premium, you build upwards. Paper and packaging specialist Mondi is a good example of this, with a high rack warehouse almost 16 meters in height at its production location in Bad Rappenau. 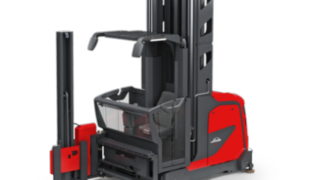 The company relies on combination narrow aisle trucks from Linde for its pallet handling and, since spring 2017, has also been trialing the latest generation of the Linde K model. 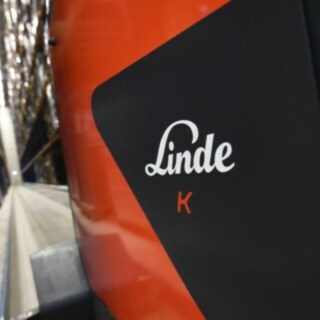 Over the last few years, Mondi has gradually switched its logistics fleet to Linde. This began in 2013 with a Linde H80 propellant gas truck with 8 tonnes of load capacity in goods-in, fitted with a special clamp for paper rolls. “These rolls weigh up to 2.8 tonnes,” explains Logistics Manager Cindy Bächle. “In our roll store, we stack them up to seven meters so we naturally need trucks with a sufficiently high counterweight.” After a short phase familiarizing themselves with the hydrostatic drive with dual-pedal control, the Mondi logistics experts seemed most impressed with their new “colleague,” especially as it makes reversing significantly easier, whether by hand or foot. 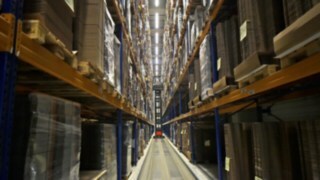 While Linde had a foothold in the material delivery area from this point, there were still narrow aisle trucks from a competitor rolling through the aisles of the high rack warehouse—until, one day, there was an incident: “At that time, the hall floor was severely worn from intensive use and the order picker had become somewhat prone to faults. There were already plans to exchange the equipment at this point in time,” explains Bächle. 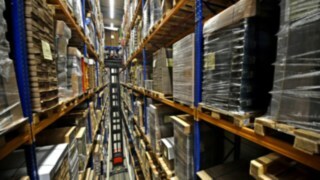 “During renovation, one of the racks got damaged and we had to act quickly as otherwise we would not have been able to store or retrieve any new products.” After the previous supplier quoted a waiting time of just under a week for the necessary rack inspection, we here at Mondi decided on the spot to turn to the Linde dealer Hofmann Fördertechnik, based in nearby Neckarsulm. enthuses Ralf Gruber, who is responsible for the Procurement division at Mondi Bad Rappenau. 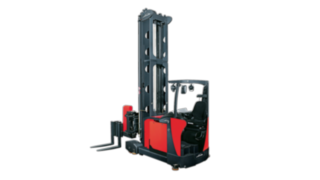 This customer focus combined with the good experiences with the Linde H80 were sufficient reason for those responsible at the packaging specialist to also consider Linde’s narrow aisle solutions. “Together with Hofmann Fördertechnik, we visited a reference business and had a look at the Linde narrow aisle trucks in operation,” recalls Gruber. The most important aspect when working in height ranges up to 16 meters is the stability of the mast. The Linde K trucks really impressed here in comparison with the competition, as forklift driver Gerhard Doberstein confirms. He has worked for Mondi for 27 years and knows exactly what the job requires. 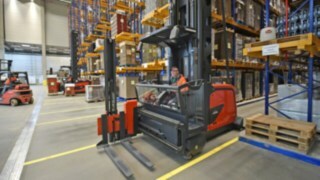 “When we visited, we could see straight away that the masts on the Linde trucks sway noticeably less; this makes work easier and much safer for us drivers.” Since the trucks from the Aschaffenburg-based material handling specialists also delivered a convincing performance in other key areas—from ergonomics to cost-effectiveness through to servicing and maintenance—Mondi’s decision-makers soon made up their minds: From now on, red would also be the dominant color in narrow aisle applications. Since 2015, Mondi has been operating two narrow aisle roller. An additional Linde H70 propellant gas truck with seven tonnes of load capacity is now supporting processes in the goods-in area. By contrast, the majority of internal production at Mondi is carried out without the use of forklift trucks: The company uses transport conveyors to carry raw materials to its various processing stations. 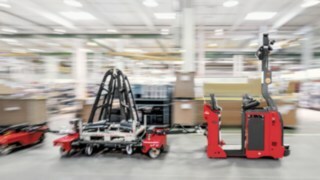 Only when the packed Euro pallets are brought from production to the high rack warehouse are two Linde H18 T propellant gas trucks, with 1.8 tonnes of load capacity, called into action; the two K trucks then take on the task of pallet handling. In the background, a fully implemented SAP system controls all production and logistics processes at Mondi; this system determines which rack location the goods carriers delivered from production should be delivered to. “From the narrow aisle truck, the operator scans a barcode on the pallets that are brought from production by the 1.8- tonne trucks. On the additional display attached to the truck, they then receive the relevant information on the rack row, bay, and level. They can also see here which pallet should be removed from the rack for dispatch,” explains Logistics Manager Cindy Bächle. “All in all, we move around 1,500 packed pallets per day." 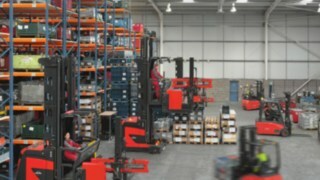 The Linde fleet at Mondi is rounded off by an L10 electric high lift pallet truck and four T18 low lift pallet trucks. The future is key: The packaging pros at Mondi Bad Rappenau see great potential for the coming years and decades in the area of automation. Schulze: “Take, for example, our delivery point from the production line towards dispatch. This work step is always carried out in exactly the same way so I could well imagine a driverless transport system being used there.” Linde and the partner dealer, Hofmann Fördertechnik, would also be the first point of contact for ideas like this. “We are in constant contact with our dealers. And, whatever the project, collaboration is always carried out on an equal footing—that’s the only way to achieve the best results,” states the Supply Chain Manager. With the Robotics4Retail survey, the EHI Retail Institute is investigating how robotics and automation are revolutionizing intralogistics. Who are the drivers of automation and what comprehensive solutions and industrial trucks does Linde offer? 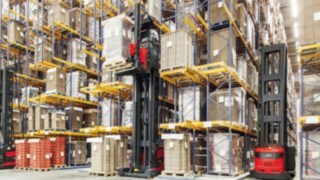 High handling performance and particularly safe handling processes in narrow aisles - Linde Material Handling has designed its turret trucks and vertical order pickers to meet the challenges of very narrow aisles. 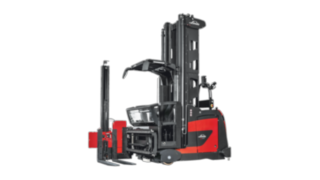 The powerful drive concept of Linde A VNA trucks provides a high handling performance.